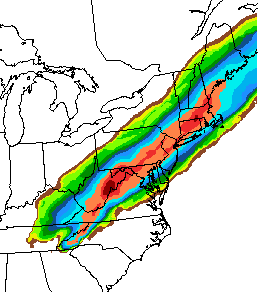 I've noticed lots of people asking "how likely" snow is with the developing winter storm in the East. 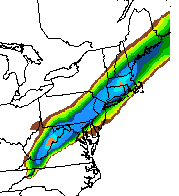 This is a map of probabilities of snow amounts. Because snow is infrequent in Arkansas, Mississippi and Tennessee one inch can cause major problems which is why I am posting the probabilities of that amount. The dark orange dot on the Tennessee-Mississippi border = 90%. In Memphis, the probability of 1" or more is 50%. Above is the probability of two inches or more. The deep red in West Virginia is 95%. Probability of 6" or more. The pink areas = 80%. Here are some probabilities for specific cities: D.C. 40%, Baltimore 55%, Philadelphia 55%, NYC 60%, Providence 70%, Boston 60%. I'd be interested in any blog reader comments as to whether they believe this is useful (i.e. specifying the probability). Finally, there is a chance of tornadoes in the Florida Peninsula today. Thanks for the comment. 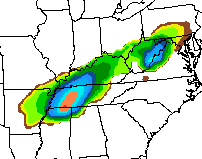 There is a 55-60% chance of 4" or more (see above map). The most likely amount is in the 6 to 9" range (see map with posting below).